It’s confirmed. Google will officially release the new Android flavor, with the codename ‘Gingerbread’. 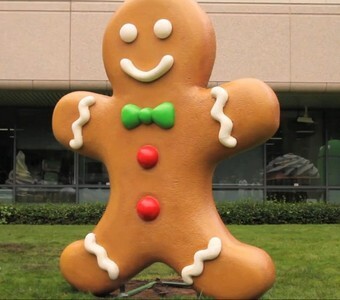 A giant size Gingerbread man was brought in to be placed at Google’s Headquarters in Mountain View, California. The talk has been going-on for days about the new name Google would be naming for the next release of Android. The Gingerbread man joins Froyo, Eclair, Donut and Cupcake at the Google Campus. Google bringing in the statue has surely got people talking again and we see that the new OS flavor is not too far away. Rumors have been running for quiet sometime that Google launch the new version of Android somewhere in end of October. Android 2.2 Froyo OS has been running quiet successfully on handsets but with the new version just round the corner, tech giants await the arrival as to launch their contribution with the latest features which the new version would bring in. Google didn’t voice out an arrival for the OS, nor the version it would be available on. Pingback: New Details Emerge About the New "Nexus Two"